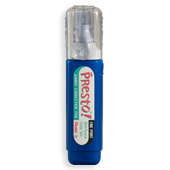 Pentel Presto Pen The Pentel Presto is a popular pen for a few key reasons. First, the ink formula is white and super permanent. The ink will cover well over most surfaces. Once you get the ink flowing through the pen, it writes really smoothly. Second, the size of this pen makes it versatile and portable. It easily fits in your pocket. In addition, the metal point is nice for little details. 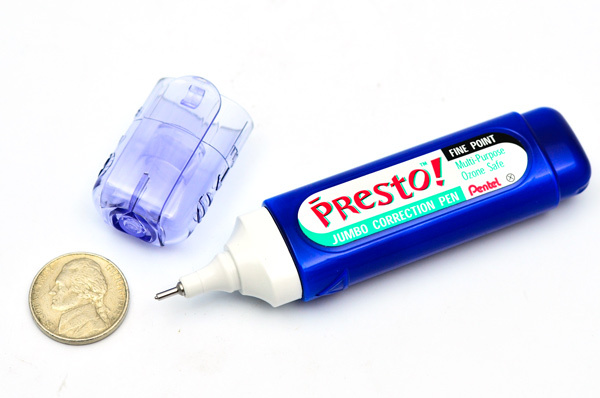 And lastly, it's a pump action pen, but you can squeeze it to increase the flow. 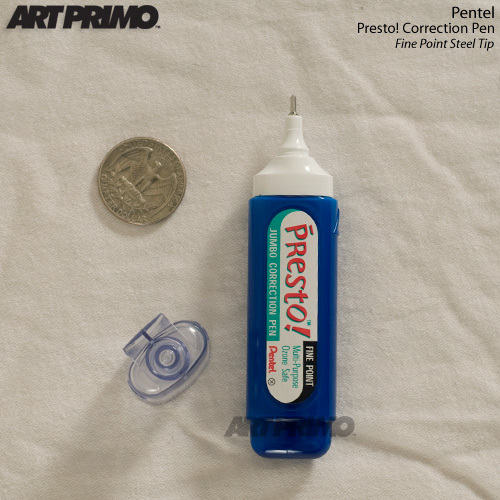 The Pentel Presto is a popular pen for a few key reasons. First, the ink formula is white and super permanent. The ink will cover well over most surfaces. Once you get the ink flowing through the pen, it writes really smoothly. Second, the size of this pen makes it versatile and portable. It easily fits in your pocket. In addition, the metal point is nice for little details. 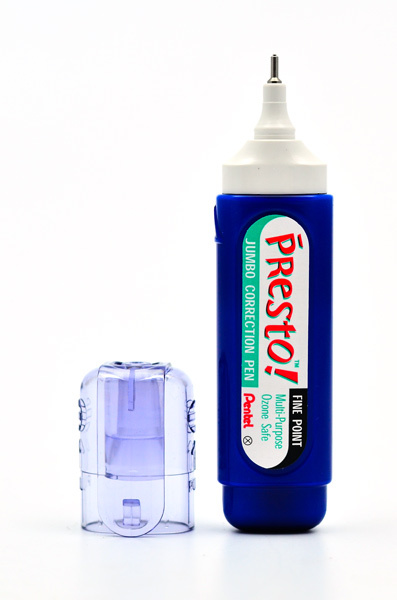 And lastly, it's a pump action pen, but you can squeeze it to increase the flow. 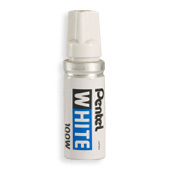 These are fun to have & can be concealed fairly easily: Very opaque white formula. These have a soft, squeezable body which is great for controlling flow while writing, but can make refilling them a b*tch, as the top is often screwed on very tightly: I have not yet been able to refill one of these without leaving some warping on the soft blue body, although this hasnt seemed to have an affect on how they write after refilling. Also, if air gets in thru the nib when the ink starts to run somewhat low, it helps to hold it upright with the pin (nib/tip) pressed down & squeeze the body to release any of the air inside. I personally switched to the pen-shaped white-outs simply because i prefer writing with that traditional body style. In my case these have become more of a novelty, but all things considered, you can't beat the price if you are a fan of the k-12, & if you are considering trying a k-12 for the first time, consider starting with one of these to see if the applicator meets your needs (but keep in mind they differ in terms of ink/paint formula: For example, the k-12's paint is thicker). This product was added to our catalog on Thursday January 15, 2009.